One fish. Two Fish. Red Fish. Blue Fish. I have wanted to be an aquarium for quite some time not and I finally made one! First, I had to find an appropriate box. I looked all around and finally my local appliance store gave me a dishwasher box. I cut most of the sides out, leaving only a small border. I covered the border with silver duct tape. Next, I bought an long roll of blue cellophane. I cut squares slightly bigger than the holes in the box and taped them into the inside behind the edges. For the fish, I printed some off my computer and picked some more up at my local craft store. The plant is actually from an old fish tank. Finally, I got together all the swim accessories I could find and jazzed up the costume. Caution: Walking with flippers can be dangerous. Just wear them for the picture. I learned this the hard way. How did you attach the fish to the cellophane? tape or glue? If glue, what type did you use? Where did you buy the cellophane roll at? I like this one a lot! Very cool. 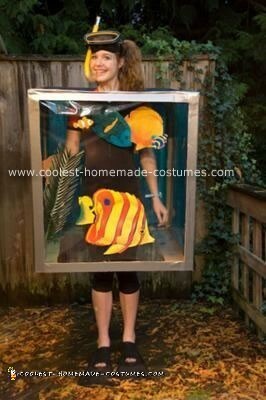 And when you want to get outta the box you can just be a scuba diver. How do you hold treats or other things with that on?Your arms are in the box. i am making the costume right now and i don`t know where the cellophane is but i think we have one and im just printing out fish on my color and good printer for the costume!